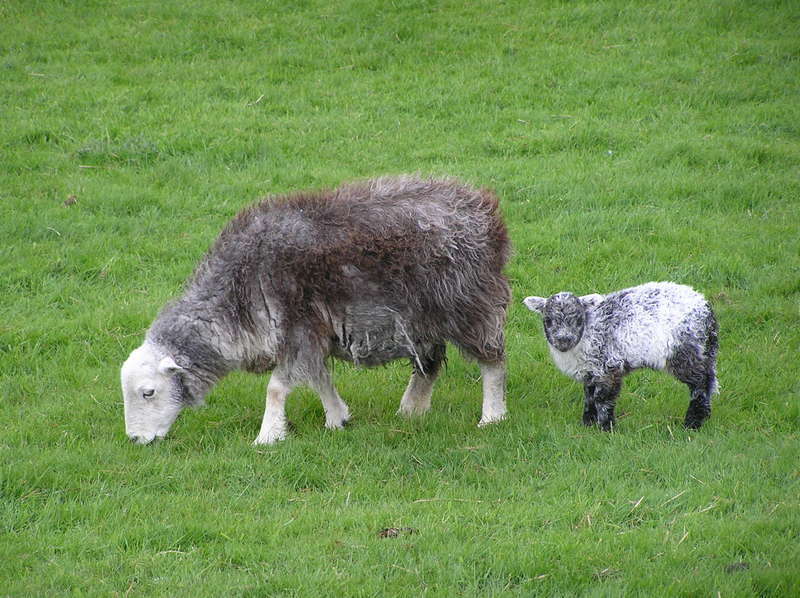 Herdwick ewe with lamb. One of the local breeds found in the Lake District. Mutton from these sheep is delicious. Recently I was lucky enough to spend a week with some very good friends in the Lake District (UK). The Lake district and wider Cumbria are not only regions of exceptional beauty, but also a places where many traditional food ways have been preserved. Morecombe bay potted shrimp, Cumberland sausage, cured hams, Grasmere gingerbread, Clipping time pudding, Kendel mint cake, damsons; the list goes on and on. One, only slightly less then local, dish that my Lancashire friends heroically made for nearly twenty people was their famous meal of (Lancashire) “Hot-Pot” and pickled red cabbage. Now I love this type of dish and this particular meal was outstanding, but one thing that has always piqued my interest is the name of the dish. For such a solid dish “Hot-pot” is a cute and somewhat childish name. Similar recipe names like “Inky-Pinky”, “Pish-Pash” and “Whim-Wham” always sound so happy-go-lucky delicious to me that I always want to eat them up. These are the sort of food that I crave now and craved as a child simply for the name alone – my mother can confirm that I had a somewhat less then realistic childhood obsession with obtaining toffee-shocks, google buns and pop cakes for instance. Some names just taste that good. The name “Hot-pot” also greatly confused me as a child, after all it was a stew made in a pot and therefore in all likelihood almost certainly going to be “hot” in my experience of stews to date. Not need to state the obvious or if this was the case, why didn’t other similar stews get similar names for instance? As I got older my curiousity about the name and the dish it describes still interests me, although now I am slightly less confused about the name and slighty more interested in the origins of it all. OK, first of all what is a Lancashire “Hot-Pot”? 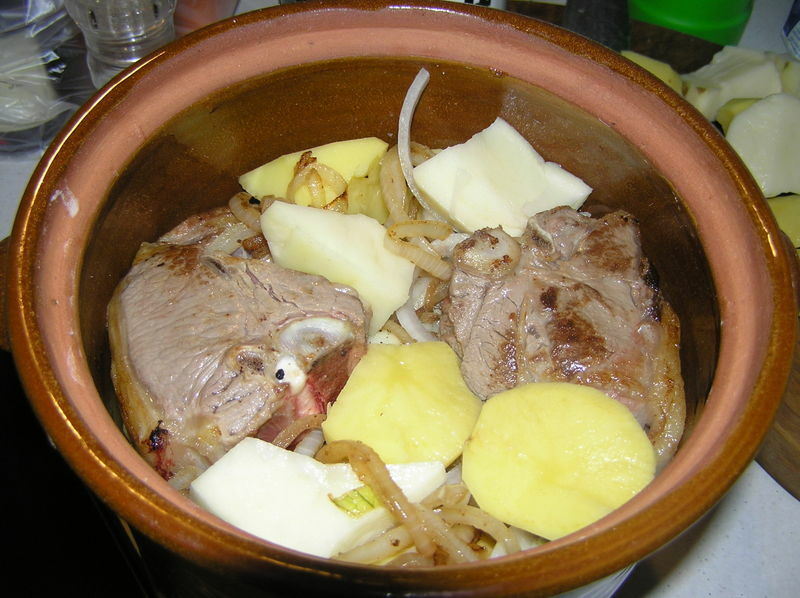 Well, in essence it is a stew of mutton (more often then not lamb is used now), layered with onions and potatoes. By tradition the stew cooked in a tall, straight sided earthenware pot. While the stew actually cooks though in an enclosed vessel, during the final half hour or so of cooking the coving is removed which allows the surface layer of potatoes to brown nicely. While variations in ingredients occur regionally and family to family, the distinguishing feature of the stew is the layer of sliced potatoes that sits on the surface of the meat and potato mixture. Variations in ingredients that occur are addition of kidneys, carrot or oysters. There are also similar dishes found throught the North-West of England and as the term "Hot-pot" has become somewhat iconic, many dishes now are labelled as a "Hot-Pot", irrespective of the vessel they are made in. Allan Davidson in the “Oxford Companion to Food” indicates a connection of “Hot-pot” with the term “hotch potch” and “hodge podge”, both terms being derived from an Anglo-Norman root “hochepot”, which in term derives from the French term “Hocher” – to shake. In other other words a shaken pot. So in the culinary sense these are terms which describe a mixture or jumble of different ingredients, and this meaning is also retained in a non-culinary sense. In this latter sense of a confusion or jumble, the term has been used at least since the medieval period. In the 14th century Chaucer was able to write “but ye han cast alle hire wordes in an hochepot”, with the expectation that people would understand his meaning. This extra meaning to the term (and derived terms) complicates things somewhat it terms of tracking the development of the recipe, as any dish of mixed or jumbled ingredients can be called a "hotch potch" or "hodge podge", irrespective of it's relationship to other dishes with the same name. Take a goose and cut it into joints. Fry the joints in fat, drain and place them in a pot with onions, herbs and spices. Add wine and water to cover the goose and stew until tender. Thicken the stew with bread, goose blood or a combination of the two. Serve the thickened broth over the goose joints. French recipes from the period are similar, if more detailed. In fact the recipe from “Le Ménagier De Paris” commonly known as “The Goodman of Paris” (circ. 1393) which was written as a detailed instructional guide for a young wife, gives us a clear view on how the stew was viewed, as in the recipe for “Hochepot de volaille”. In this recipe it is suggested that this dish is made when the goose in question was tough and skinny, as the normal method of roasting the goose is inappropriate due to the lack of fat. Tough beef is also suggested as an alternative. So essentially we have a method for dealing with tough lean pieces of meat that are of no use for roasting. Obviously tough meat isn’t confined to medieval France and England alone, so there similar recipes in a number of different locations. So in early 16th century we also find Dutch and Flemish recipes for “Hussepot” and “Heusepot”, along with the French “Hochepot” and British “Hodge podge”. There are still descendents of these dishes in the modern Netherlands and Flemish regions if Belgium and France. In 16th century England, goose no longer is part of the recipe, but in essence it remains a stew of meat and onions, thickened with bread. By the 17th century this dish is less commonly mentioned in cooking texts, although those that are menioned are very similar to those found in 16th century texts. Boyle a neck of Mutton or a fat rump of Beef, and when it is well boyled, take the best of the broth and put it into a pipkin and put a good many onyons to it, two handfull of marigold flowers, and a handful of percely fine picked and groce shredde and not too small, and so boyle them in the broth and thicke it with strained bread, putting therin groce beaten pepper, and a spoonfull of Vinagre, and let it boyle somwhat thick and so lay it upon your meat. Take a Pot of two Gallons or more; and take a brisket rand of Beef; any piece of Mutton, and a piece of Veal; put this with sufficient water into the pot, and after it hath boiled, and been skimmed, put in a great Colander full of ordinary pot-herbs; a piece of Cabbage, all half cut; a good quantity of Onions whole, six Carrots cut and sliced, and two or three Pippins quartered. Let this boil three hours until it be almost a gelly, and stir it often, least it burn. The lack of "Hodge Podge" or "Hotch Potch" dishes in the great bulk of the many cookbooks published in England during the 17th century is rather curious, until one considers the great popularity of similar dishes with foriegn names. One candidate replacement dish is the very popular "Spanish" Olio Podrida dishes (often shorted simply to "Olio"). These Olio dishes could be very elaborate, reflecting the nature of Restoration Stuart cooking, but in essence they were a jumble of ingredients cooked together as a thick soup or stew. This and the fact that "Hodge Podge" and "Olio Podrida" sound similar most likely accounts for lack of dishes called "Hodge Podge" in the 17th century. During the 18th century this trend was reversed, possibably this was due to the increased popularity of joke names for dishes during the latter part of the 17th century, "Hodge Podge/Hotch Potch"", trifle and fool" being notable examples. In any case, bu the mid-18th century "Hodge Podge/Hotch Potch" became a popular term once more, so much so that in 1807 Duncan MacDonald in the "The New London Family Cook" gives a recipe for "Hotch Potch, or English Olio". As can been seen in Digby's recipe and also alluded to in the 18th century by Elizabeth Moxon “This is a proper dish instead of soop.”. In other words, while the ingredients of the dish had changed dramatically over 400 years, it was still essentially a thick and hearty one pot meal. By the end of the 18th century “Hodge Podge/Hotch Potch” had become popular enough that regional variations were recognized, notably in Scotland. In Scotland Hodge Podge/Hotch Potch recipes are given by Elizabeth Cleland (1755) and Meg Dods (1829), in the latter case a specific “Scottish” version is mentioned (a similar recipe appears in later printings of Mrs Rundell’s book influencial cookbook). Hodge Podge becomes so established during this period that by the 20th century it is called a "Scottish" dish in many cases. Meg Dods' (1829) "The Cook and Housewife's Manual"
"Make the stock of sweet fresh mutton. Grate the zest of two of three large carrots; slice down as many more. Slice down also young turnips, young onions, lettuce, and parsley. Have a full quart of these things when shred, and another of young green peas. Put in the vegetables, withholding half the peas till near the end of the process. Cut down four pounds of ribs of lamb into small steaks, trimming off superfluous fat, and put them in stock. Boil well and skim carefully; and the remaining peas and white pepper and salt; when you think it thick enough serve the steaks in a tureen with the hotch-potch. - Obs. The excellence of this favourite dish depends on mainly on the meat, whether beef or mutton, being perfectly fresh, and the vegetables being young and full of sweet juice, and of being boiled until of good consistance. The sweet white turnip is best for hotch-potch, or the small, round, smooth-grained yellow kind peculiar to Scotland, and almost equal to the genuine Navet of France. Mutton-chops make excellent hotch-potch without any lamb steaks. Parsley shred, white cabbage, aparagus points, or cauliflower may be added to the other vegetables or not at pleasure. The meat may be kept wholeof served seperately." So we have a lot of information on Hodge-podge/Hotch-potch. Unfortunately there doesn’t seen to be any direct relation between “Hot-Pot” and any variation on Hotch-Potch or Hodge-Podge. While it is tempting to suggest that Hot-Pot is simply a variation in the pronouciation of Hotchpot/Hotch-Potch or Hodge-Podge (or even variation on the Flemish “Hutspot”, due to the presence of this group of people in the Lancashire Milling industry), there doesn’t seem to be any clear evidence to suggest this. However, even the suspicious similarity between the shape of the earthenware vessels used to cook Lancashire Hot-pot and the Northern French Hochepot, seems to be coincidental. In fact, much as been made of the traditional shape of the Hot-pot vessel it self and how it's shape was designed to accommodate the extra long shanks of the cutlets derived from the local sheep breeds. Unfortunately this tends to ignore the fact that bones can be broken up or removed and that the other similar dishes don’t require this special consideration, so maybe there is another reason for the traditional shape of the vessel. In the recipes for Hodge-podge or Hotch-potch, not mention is made at all of use of a specific type of pot. I also can't find any specific mentions of any variation of Hotch-potch/Hodge-podge of Hochepot in any of the earlier Lancashire dialect dictionaries. "Hot-pot" doesn't occur in these texts either for that matter. However, where early references to the word do occur is very important. Allan Davidson points out that the earliest reference to "Hot-Pot" actually refers to a drink. Hot-pots were a popular celebration dish, especially as part of the wedding celebrations in Yorkshire. References to "Hot-pots" are common in late 18th century texts, from regions as wide ranging as Scotland (were it evolved into the New Year celebration drink "Het Pint"), Northhampton and East Anglia. Essentially "Hot-pot" was an alternative or local name for a type of posset. Possets are warmed alcoholic drinks that are often thickened in some way and often served as a celebration drink. In Yorkshire this "hot-pot" seems to be a drink of hot sweetened and spiced ale. The traditional shape of a posset pot is a tall, straight sided ceramic vessel with handles on each side (see Ivan Day's site), some versions even had a drinking spout. Modern double handled cups are often known as "Loving cups" due to their associations with wedding celebrations. It seems very likely to me that the name of "Hot-Pot" was given to the stew based the similarity of the cooking vessel to the drinking vessel. This requires further investigation. The fact of the matter is that the earliest reference to the familiar Hot-pot dish of Lancashire is from the mid-19th century. While there are some possible references to "Hot-pot" by Thackeray and in less well know books like one childrens word primer which gives the line "The hodge-podge was poured out of the hot pot", the first clear reference to Lancashire Hot-pot is given by Allan Davidson in "The Oxford Companion to Food" as appearing in Mrs Gaskell’s “North and South” (1854), where the author vividly describes the impressions of a mill owner of a meal which he takes with his working men. “Hot-pot” is described as an “especial dinner” in other words not an every day meal, even at the traditional home of the Hot-pot – at the Mill. Early 20th century historical accounts describe how in some mill communities, hot-pots were delivered by children from the workers homes to the mill while still warm, in much the same way that dabbawala deliver tiffin in the Indian city of Mumbia. As Mrs Gaskell clear felt that her readers would be in someway familar with the term "Hot-pot" this suggests that the dish dates back further then the mid-19th century, the vast amount of recored information on the dish actually dates from the late 19th and early 20th century. Potatoe pie (Rundell) Skin some potatoes, and cut them in slices: season them; and also some mutton, beef, pork or veal. Put layers of them and the meat. A Potato-Pie (Meg Dods) , made of sliced potatoes an onions, butter, pepper and salt is a good nursery or cottage dish, but a temptation and a trial to the gourmands temper, and an affront to the cook’s puff-paste, when covered and ostentatiously served up as a savoury pie. In other words good enough for the poor or young, but not to be taken too seriously. Working people’s food this may be, but ironically these dishes have survived to the present day as iconic regional dishes, unlike so many other more upwardly mobile 19th century recipes. Helen Pollard describes in “Traditional Food East and West of the Pennines” how potato pie is a popular dish at Lancashire social events and how it is cooked in pie dishes of similar shape to hot-pot dishes (and served with the again with pickled red cabbage, beetroot of onions). Oddly enough, while the first reference to Hot-pot in print is date to 1854, within a few years of this date the familiar dish emerges fully formed in a number of cookbooks, like a potato-y Venus. The English cookery book, receipts collected by a committee of ladies, and edited by J. H. Walsh, (1859). A Lancashire dish, is much liked; so much so, that every one at the table always partakes of it, and most persons make their dinner of it. This dish must be made in a fireproof pan, resembling in shape a turtle-mug or cheese-pan. Cut three pounds of rump-steak into square pieces, cut eight or ten potatoes into quarters, some whole small onions, and mushrooms if in season, all well-seasoned with cayenne black pepper and salt, together with a dozen kidneys; place all in layers on the other, pour over them three or four table-spoonfuls of mushroom catchup, and put six or eight dozen oysters at the top, cover it with a crust, and bake for two hours. A few larks or snipes are a great addition to the above. In the latter dish, although it is called a Lancashire "Hot-pot", due to the presence of the crust it would actually be called a "Potato Pie" now (although a very over-top version). So it seems that Lancashire Hot-pot was a variation on a theme, with many similar dishes being made within the region and in nearby regions and it seems likely that the name of the dish is based on the name of an earlier celebration posset or 'hot-pot'. As it stands, I believe that it is likely that in the homes and mills of people that actually ate Hot-pot, potato pie etc on a regular basis the was no fixed recipe as such. The amount of meat varied from, based on price, extra ingredients were included or not based on local availability and cost. 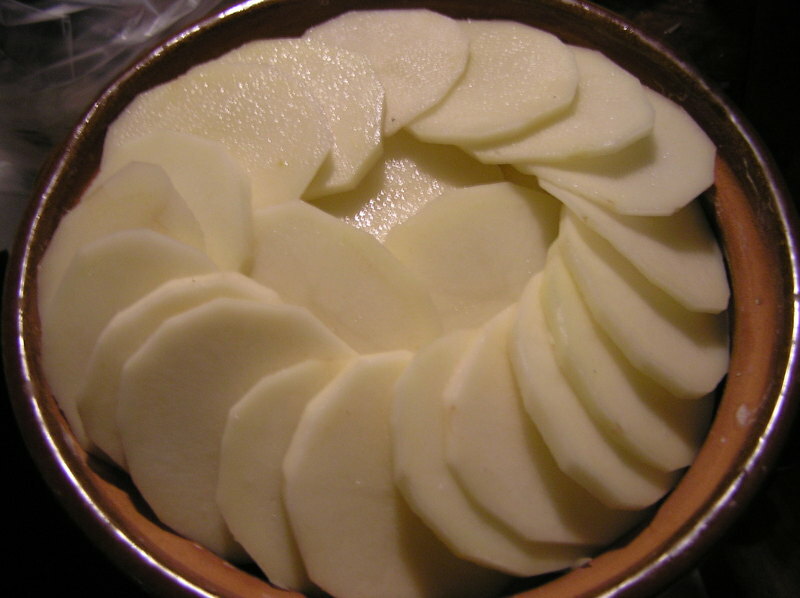 If it contained a pastry crust it was a potato pie, if surface layer of browned potatoes it was a Hot-pot, potentially there are even regional variations in the names for the same dish. So in the end I don’t believe at this point that a direct connection with the earlier medieval Hotchepot dishes and Lancashire Hot-pot can be made, unless similar in composition, but linguistically unrelated dishes like potato pie are also included. But I also don't think matters that the dish can't be traced back 700 years. In some articles on British culinary history where people are trying to make a connection with the past, there can be a tendency to try to too hard and make misleading claims. Dishes like Lancashire Hot-pot, 'Scouse and Potato-pie, don't need this they have their own unique history and cultural significance. People still make them as regional dishes in the UK and sometimes that is all that we should desire. "Melbourne Hot-pot". Hogget chops have been browned first, then onions have been cooked in the resultant drippings until brown, flour was added to the onions and also a little lamb stock. Two types of potato are used, one waxy and one floury. The latter disolves into the stock during the cooking, whereas the former remains intact. All these ingredients are jumbled together. Finally, a layer of potato is placed on the surface and stock is added to cover. The Hot-pot is placed in a pre-heated oven at 160.C and cooked for three hours. In the last half hour of cooking, the lid is removed to allow the potatoes to brown. 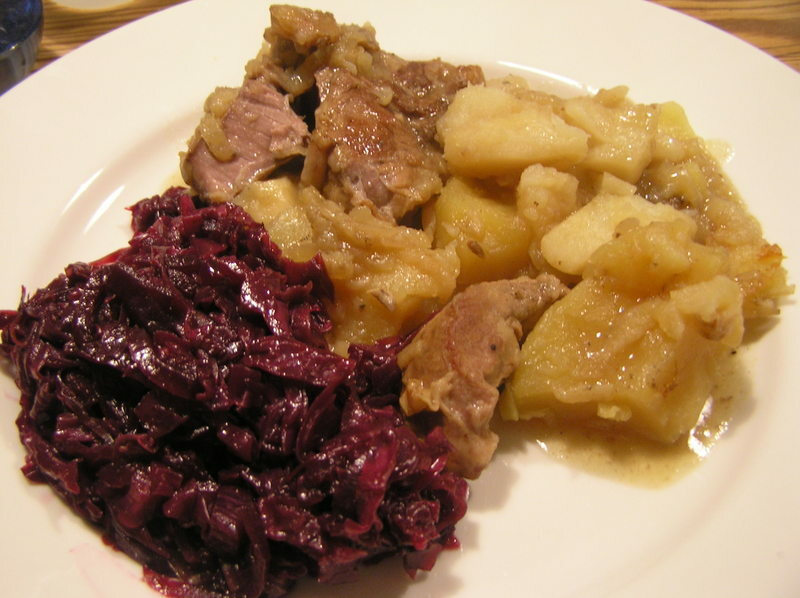 Tender still pink meat and melting potatoes and onions. I like to mush the intact potatoes into the gravy with the back of my fork, so that the potato crumbs can absorb even more of the juices. With pickled red cabbage obviously (this is very important and the acidic cabbage is a perfect foil to the lamb and potatoes). Dinners and Dinner-Parties by G. V, Dinners (1862).